By booking with us you qualify to earn travel vouchers. Simply email a review of your trip to the Seychelles to cheapflights@southafrica.to and we'll send you some travel vouchers. 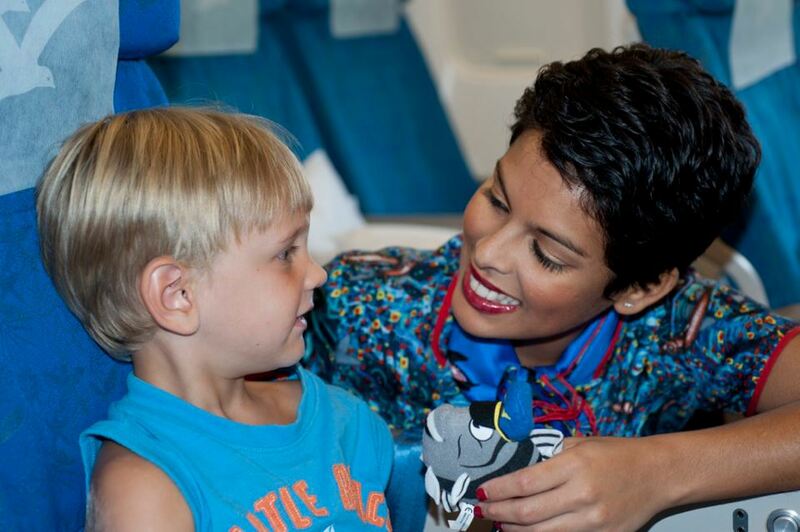 Ask an Agent - our travel consultants are itching to assist you! We're here to set up a package holiday for you to the Seychelles. Step 1 is to fill in the form below. You'll need to decide which island you want to stay on: (1) Mahé Island is the largest island, and is where most of the locals stay. It is where international flights land, and so offers the cheapest holiday. (2) Praslin Island is the 2nd largest island, and its Anse Lazio beach is rated in the top 25 beaches in the world, & has the Lemuria designer golf course on it. (3) La Digue is a quieter smaller island, more exclusive & offering greater scenic beauty than Praslin Island or Mahé. The temperature varies little, from 24 to 31 degrees celsius, with it being slightly cooler in July and August. There is the least rain in June, July and August. Mahé Island has slightly more rainfall than the other islands. All in all, May to November are the best months to visit. Self-catering apartments on Mahé Island, 5 minutes from the Anse Royale beach, with spacious rooms & spectacular views over the Indian Ocean (especially from rooms on the top floor). Self catering with the option of meal supplements at Le Relax Beach House, situated on La Digue Island. Long Beach Holiday Apartments are self catering departments situated on Praslin Island, overlooking the ocean on the Seychelles' longest beach. Your flight to the Seychelles land will land at Seychelles International Airport on Mahé Island (all international flights land there), which is called Aéroport de la pointe Larue in the vernacular. If you have an onward flight to another of the islands in the Seychelles, you will need to walk to the domestic terminal, which is situated north of the international flights terminal. Outside the airport you'll find the buses of Masons Travel & other tour operators, as well as taxi ranks to just about everywhere on Mahé Island. 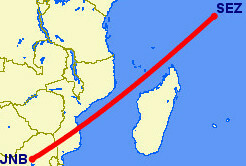 Air Seychelles is the only airline operating direct flights from South Africa (Johannesburg) to the Seychelles. 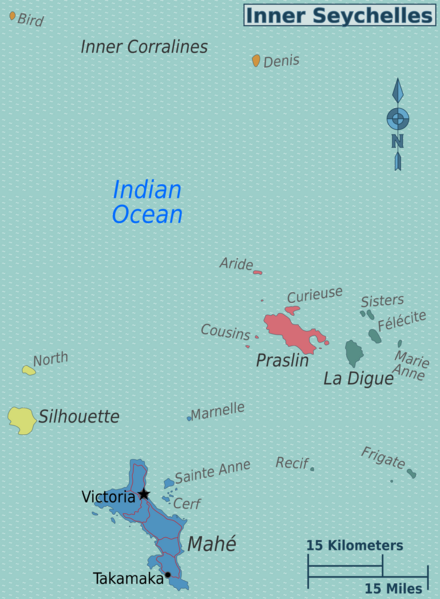 English & French are official languages (as well as the Seychellois Creole) - the Seychelles had no indigenous people. Most citizens are Roman Catholics.